This is one Land Cruiser that isn’t afraid of the spotlight. Its sunny disposition and upgraded running gear make it the perfect companion for casual driving in our client’s hometown of Houston, Texas. This Land Cruiser’s steel armor and chassis from the late 70s have been brought back to near-original quality, perfected and repainted in one of Toyota’s boldest shades - Yellow (532). Its iconic shape, accented with retro details: 80’s-style mirrors and emblems, the round front grille, and all of the bolts, hood latches, and heavy rubber — everything diehards would never do without. 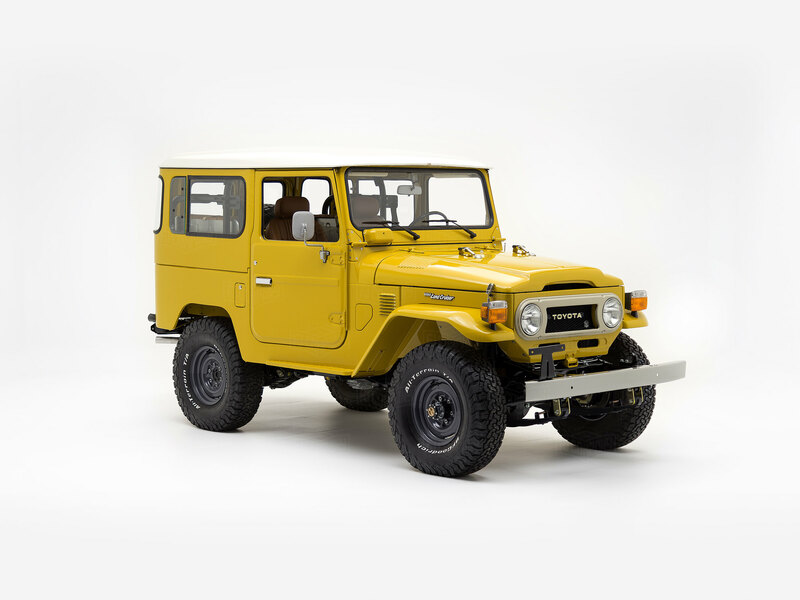 This Land Cruiser proves that a classic car can still be fun to drive. You will still find a classic Toyota 2F under its hood, but we’ve breathed new life into the carburetor and paired it with a smooth-shifting five-speed. Then, we upgraded everything else: the brakes, the power steering system, and the suspension to bring this truck up to speed for today’s roads. Of course, 4-wheel drive is standard, and now, it’s better than ever! The interior of this Land Cruiser makes every journey feel like a flashback. Here, the brightness of the exterior collides with warm browns and tans to create a 70's-style ruggedness accented with retro details and classic stitching. And if you think this Land Cruiser is livin’ in the past, you’ll want to do a double-take. Covert modern features bring essentials like the perfect temperature, your favorite playlists, and hands-free calling into the classic cabin, without killing the vibe.